Parking Near Central Union Mission. Home > Who We Are > Locations > Parking Near Central Union Mission. Parking near Central Union Mission at 65 Massachusetts Ave, NW. is very limited. Below is a map of public parking facilities near the Mission. 25 Massachusetts Ave – Republic Square Garage – 0.06 mi. 660 North Capitol St. NW – Garage (Lot 865) – 0.10 mi. 820 1st Street (99 H St. NW) – Walmart Garage – 0.14 mi. 400 N Capitol Street – Hall of States Garage -Lot 119 – 0.17 mi. 800 North Capitol St NW – 0.18 mi. 10 G St. NE – Valet Assist Garage – 0.18 mi. 99 H. St NE – Union Station Self Park – 0.28 mi. 750 1st St. NE – Valet Assist Garage – 0.35 mi. 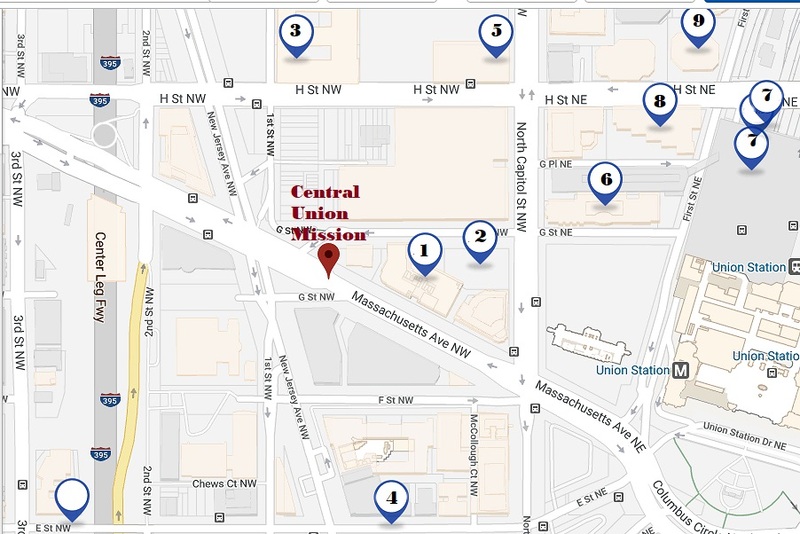 810 1st St. NE – Union Center Plaza Valet Garage – 0.39 mi.